As Reliance Industries Limited (RIL) has completed 40 years of its inception in 2017, the company pitches Akash, Isha, and Anant Ambani as the next generation of Indian's one of the most valued companies. 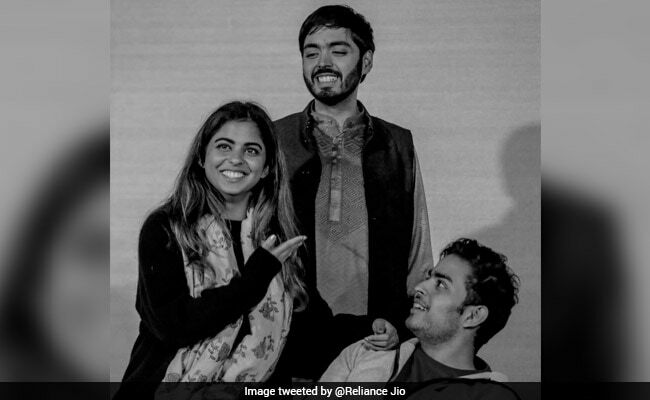 Under the caption "Getting Ready For Tomorrow, Today" the company posted a black and white image of Akash, Anant and Isha Ambani, the three children of Mukesh and Nita Ambani. The tweet has been made from the Reliance Jio's handle. It is noteworthy to mention that the Reliance Jio's feature phone was launched by Mukesh Ambani's 25-year old twins Isha and Akash Ambani in July this year. All three siblings are shown pleased in the image and were probably caught unaware when the picture was taken. The two brothers are looking at their only sister Yale University-educated Isha while she is reacting with a hand gesture towards Anant. The image even evoked a reaction from Shah Rukh Khan who said. "Have seen Akash, Isha and Anant grow up and it is lovely to see them take forward the values and ethos of Reliance with such grace. Looking forward to celebrating with them tomorrow." The company will celebrate the 40 years of Reliance Industries (RIL) at Reliance Corporate Park (RCP) today where mega star Amitabh Bachchan, Shah Rukh Khan have been invited, among others.